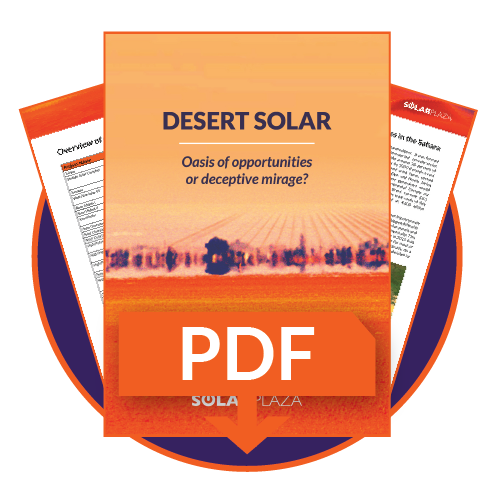 Solarplaza’s latest white paper takes stock of the solar developments in the deserts of Africa so far, providing quick overviews on individual desert nations and the success and failure of regional programs related to realizing the vision and potential of desert solar applications. It's one of the favorite thought experiments of the solar industry, one that gets quoted endlessly and pops up in all types of contexts; the solar potential of the deserts of Africa. Rudimentary calculations state that if you were to cover an area of 335 square kilometers (or 43,000 square miles) of the Sahara Desert with solar panels, it would yield more than 17.4 TW of power. Thus, ‘solarizing’ just 1.2% of the desert’s surface could be enough to cover the energy needs of the entire world. Projected costs have been estimated at "a mere" five trillion dollars at today's prices (fun fact: that is less than the bailout cost of banks by Obama in the last recession and equals 1/4 of the US national debt, or 10% of the global annual GDP). Apart from the obvious advantage of increased access to cleaner power, recent studies have also indicated fascinating side-effects, pointing towards solar’s potential to increase political stability, counteract extremism and even lead to increased vegetation-growth in the desert. Up until now, however, that dream has remained beyond reach. Several initiatives have tried to scratch the surface of this potential, but few have succeeded. It’s not all just a story of wasted potential, though. There are some shining examples of desert solar applications that keep the dream alive and light the way. Fully realizing the true solar potential of the deserts of Africa, will require a vast effort, one that will need to align visionary governments, courageous development finance institutions, pioneering investors and experienced developers. Complying with our mission to “accelerate the sustainable energy transition”, we seek to support these efforts by creating the right platforms for these parties to meet, share ideas and form effective partnerships. In addition to our annual Unlocking Solar Capital: Africa conference and our Desert to Solar trade missions (organized in partnership with the AfDB), we will, therefore, launch a new event, specifically focused on this particular challenge. The Solar Future: Deserts of Africa (1-3 May 2019; Addis Ababa, Ethiopia) will be a deep dive into the specifics surrounding solar project development in Africa’s desert regions, including the countries that comprise the Sahara and Sahel deserts. As a preparation for this event we sought to take stock of the past, current and future initiatives related to the development of solar capacity in the African deserts, in order to provide context to the discussion we’ll aim to incite during the event. For the purposes of this report, namely determining the scope and scale of renewable energy ambitions in the region, we’ve included both photovoltaic and concentrated solar power initiatives and projects.